Oh I'm back. I'm back and how. On a rare serious note, we, the 20-somethings who are just into a job, and hence will (willingly or not) work ungodly hours, with a rare weekend in between, are starved for time. Time for a hobby. Time to read. Time to be lazy. Time for myself. I really am tired. I really did not study so much, work so hard to be a machine. And so it's a conscious choice that while we will work (why not? It's our age to. ), we will take out time for ourselves to indulge our self. Do whatever we want. Play Chefville on Facebook (have you played that game? It's so much fun!). Watch trashy TV. Play a game. Catch up on a little sleep. Catch up on a long lost friend. Cook. Eat. Blog. I have so many things to tell you guys! Okay now to the good bit. It's not really a surprise that I like chocolates. By like I mean take out on a date, pay for dinner, do a little dance level like. So as much chocolate that goes in a confectionery is only good, right. Right? Anyone? So, when one says Triple Chocolate Brownies, my Inner Voice (from my tummy) says, "It's just a number." Challenge accepted? Oh you bet. 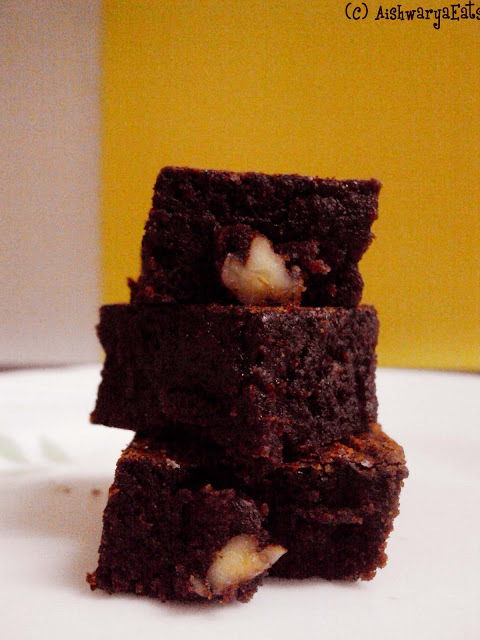 Presenting, I-Have-No-Idea-How-Much-Chocolate Brownies. Whole grain for a touch of health (cue the sanctimonious voice). I swear on them, they are Un. Believable! 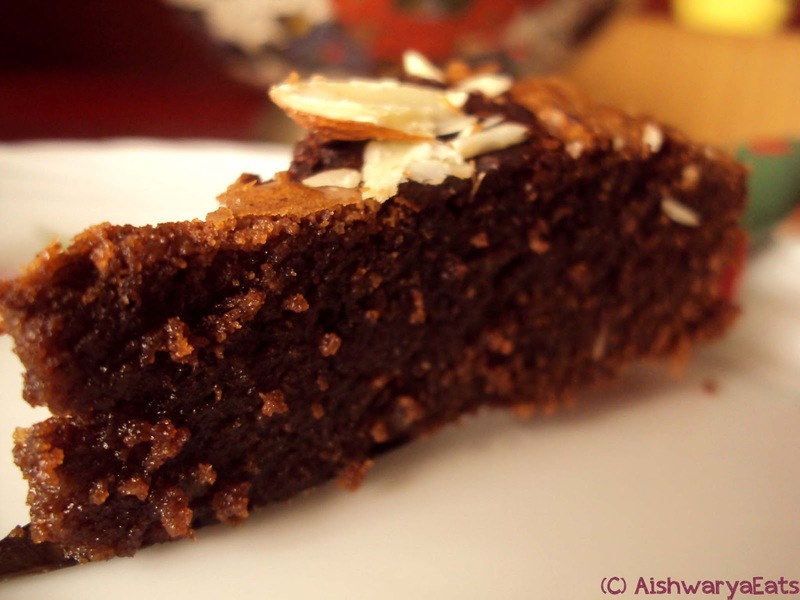 Dense, moist, chewy, chocolaty but not cloyingly sweet, with bits of toasty nuts in it. And the best part, for me as an amateur baker. I finally got the light beige papery crust on the brownies! Yes! See the dense just-barely baked centre? It doesn't require much more than a little hand-power, because as I have experience in two occasions, over working the batter will lead to a dry crumbly brownie, and THAT is never good. At least 2-3 full bars of Dairy Milk chocolate. The big bars. 1 tsp vanilla extract or a bit of coffee. You can totally leave this out. Walnuts/ almonds/ cashews/ hazelnuts, toasted. You could leave this out for any allergies. A couple of bowls and a whisk. Muscle power. You don't need the KitchenAid for this one. Melt the chocolate bar in a double boiler with a little bit of the oil/ butter. To this, add the vanilla or the coffee. The coffee should be mixed in a bit of hot, hot water. Whisk the eggs and the sugar little by little till it's at that pale yellow ribbon-like stage. Whisk in the butter/ oil at this point. Stir in the salt and the cocoa. Pour in the melted chocolate. Burn your hand a bit because you carelessly pounced on the hot pan. Sift in the flour. Fold in till JUST MIXED. I'll really pity you if it's overwhisked. At this point, the batter will look like brown coloured flubber. Don't worry! Pour this into a greased pan and bake at 180 Celsius for about 20 minutes. Take out finally when the centre is JUST set. The knife/ toothpick should be just barely clean. Take it out and slice it up. If your's is a round pan, then eat the crispy corner pieces and say they never existed. So there you have them. 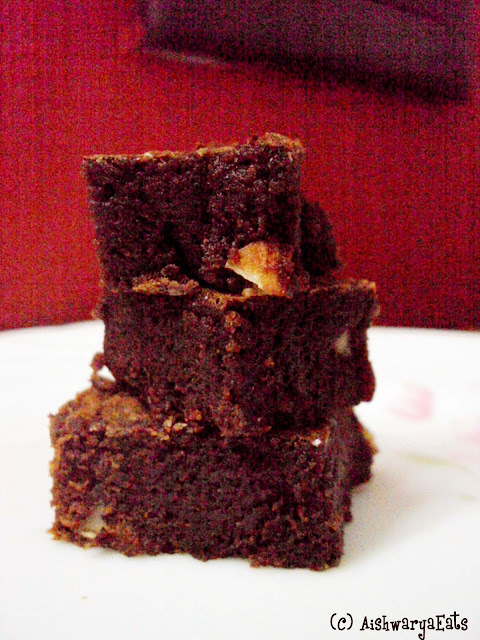 The World's Best Brownies! If you make it, tell me if there's anything you'd change or omit/include. Until the next time, and this time, it won't be long! I had to show you these new photos of the second batch of these I made. These were even better! Akanksha: This is the recipe I was talking of! Ah yes :) So this one could be baked in a microwave or a conventional oven only? Thank you so much Mukta! Rekha: I love you for saying that! For all you guys to actually like them, it really means the world to me!